The paper industry is changing faster than ever and there is no end in sight. Get a burst of inspiration with great ideas every week! Exclusively for designers, print buyers and paper professionals who feel a deep passion for the tactile experience that is paper and print and are dedicated to devouring massive amounts of tips, tricks, insights and inspirations. Are you missing the Six Simple Rules for QR Codes? Do you know How to Decide: 4-color vs Spot Color? Do you know how to Conquer Type-Killer Colors? and oh-so-cool offers! It's free and easy! 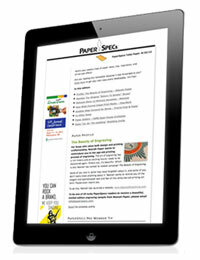 "PaperSpecs is without a doubt THE online source for paper information, period." "Today’s designer has to be on top of everything - including paper - or... at least know somebody who is."